Nick Schneiders signed a three-year contract with BBL team New Yorker Phantoms Braunschweig. 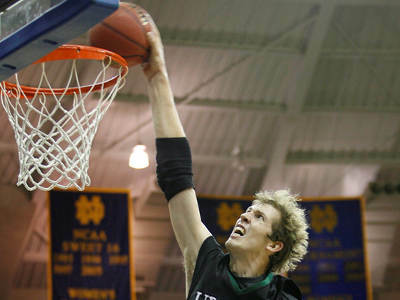 The 25-year-old big man orginally fromBielefeld graduated from USC Upstate this year and will continue his basketball career as a player with Braunschweig. During his five years in college he averaged 12.4 ppg.6.8 rpg and 3 bpg. With this numbers he became the Spartans all time leader in blocked shots. He als was voted into the All America 2nd team. Braunschweig sport director Oliver Braun is sure that the tall German will make an impact in the BEKO BBL. ‘Despite his 220cm, he is quick on his feet. It will be difficult for any player to get off a good shot against him. We will give him time to get used to the BEKO BBL. We are happy that he decided to come to Braunschweig despite having many other offers’, said Oliver Braun. Schneiders is also happy that he can start his professional basketball career in Braunschweig. ‘Braunschweig is the ideal situation for me. I had a nice talk with coach Sebastian Machowski, the Volkswagen Halle is super and its not too far to my home town Bielefeld. Braunschweig is a very successful team and I think I can get used to teh Bundesliga quickly. I can develop well here’, stated Nick Schneiders.